Take this free practice test to see how prepared you are for the PRAXIS Core Exam and the PRAXIS I teacher certification test. Most states use the PRAXIS Series of Exams to license teachers to teach in their classrooms. The PRAXIS Core Academic Skills for Educators test and the PRAXIS I evaluate three subject areas: Math, Reading and Writing. 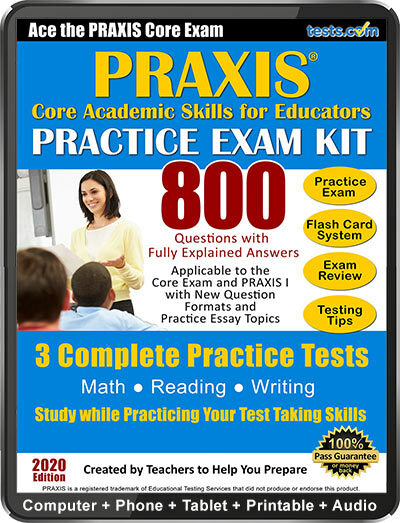 For 800 Praxis practice questions including explanations to the answers check out the Practice Test Kit for the Praxis Core Exam. 1. Linda drives 30 miles to the dentist. She then travels another six miles to get to the utility company and 12 miles to the grocery store. Assuming the utility company and the grocery store were both on her way home, approximately how many miles will she still have to drive to make it home? 3. A "metaphor" is a figure of speech that compares two different things, usually with the words "like" or "as." 4. Use the following passage to answer questions 4 through 7. It was in the last four decades of the ninth century of our era that Norsemen began to leave their own country and set up new homes in Iceland. The sixty years ending with 930 A.D. were devoted to taking up the land, and the hundred years that ensued after that date were devoted to quarreling about that land. These quarrels were the origin of the Icelandic family sagas. The year 1000 brought Christianity to the island, and the period from 1030 to 1120 were years of peace in which stories of the former time passed from mouth to mouth. The next century saw these stories take written form, and the period from 1220 to 1260 was the golden age of this literature. In 1264, Iceland passed under the rule of Norway, and a decline of literature began, extending until 1400, the end of literary production in Iceland. In the main, the authors of Iceland are unknown. Which of the following best expresses the main idea of the passage? a.Christianity brought peace to Iceland. b.Icelandic literature flourished briefly but was extinguished under Norwegian rule. c.Iceland was founded by Norsemen. d.Old Norse literature was spread through word of mouth. 5. According to the passage, when did Norsemen begin setting up new homes in Iceland? b.Sixty years prior to 930 B.C. 6. Based on this passage, the golden age of Norse literature came when ______________. 7. Based on this passage, what can we infer about Norsemen? a.They were a peaceful people. b.They brought Christianity to Iceland when they first arrived. c.They were not indigenous to Iceland. d.They divided up the new lands equally and fairly. 10. A "simile" is something that is used to represent something else. An "allegory" is a form of extended metaphor that has religious, political or social meanings. An "analogy" is a similarity between similar features of two or more different things. A passenger train left San Diego and went to San Francisco and back. The trip to San Francisco took three hours, but the return trip took four hours. If the train averaged six kilometers per hour on the trip back to San Diego, find the average speed of the train during the outbound trip. The length of the hypotenuse of a right triangle can be found by taking the square root of the sum of both sides. 22. Barbara purchased three shirts each for $12.54, and two pairs of shoes each for $29.98. How much did she pay in total for these items? 23. Use the information presented in the following passage to answer questions 23-28. Samuel Clemens is still one of America's most beloved authors, more than a century after his death. The majority of people know him only be his pen name, Mark Twain. Twain was born on November 30, 1835 in Florida, Missouri. He grew up in nearby Hannibal. Only three of his six siblings lived to adulthood. His father also died when he was only 11. These early experiences greatly impacted young Twain and forever shaped his outlook on the world. Twain first worked as a printer; he was apprenticed at the age of 12. When he tired of the printing industry, he became a riverboat pilot on the Mississippi and then tried gold mining with his brother Orion. When none of these ventures succeeded, Twain took a job as a journalist. It was in writing that he found his life's true calling, and he soon became a popular author. He would go on to write such classics as The Adventures of Huckleberry Finn and The Adventures of Tom Sawyer. Throughout his life, Twain was plagued by personal tragedies. Three of his four children preceded him in death; his son did not live past infancy. He also lost a number of close friends and experienced numerous financial problems. Halley's Comet heralded Twain's birth, and he wanted to live long enough to see it again. He got his wish and died one day after the comet's next approach to earth, on April 21, 1910. What genre does this passage fall into? 24. Determine which of the following statements from the passage is an inference or opinion, rather than a testable fact. a. Twain was born on November 30, 1835 in Florida, Missouri. b. His father also died when he was only 11.
c. These early experiences greatly impacted young Twain and forever shaped his outlook on the world. d. He got his wish, and died one day after the comet's next approach to earth, on April 21, 1910. 25. Based on the passage, what is the most likely definition of the word "apprenticed?" 26. Which of the following would be the best way for someone to prove that Twain is one of America's most popular authors? 27. How many deaths in the family did Twain experience as a child? 28. How did Twain probably feel about his father's death? a. It probably had no effect. b. It led to his career as a writer. c. It caused him to suffer severe depression. d. It is impossible to determine the exact effects from the material presented in the passage. 29. For questions 29 and 30, use the following information. Lisa travels a total of 67 miles to see her brother. Her friend Maria's house is on the way. Lisa passes Maria's house when she is 79 percent of the way to her brother's house. How far has Lisa traveled when she passes Maria's house? 30. After visiting her brother, Lisa stops at Maria's on the way home. How far has she traveled, in total, when she stops at Maria's house? 32. Which of the following best describes a “working hypothesis” in the formation of a research paper? a. A definitive conclusion of a research paper. d. An hypothesis is never used in the formation of a research paper. 33. Use the following passage to answer questions 33 - 35. (1) We Americans devour eagerly any piece of writing that purports to tell us the secret of success in life; yet how often we are disappointed to find nothing but commonplace statements, or maxims that we know by heart but never follow. (2) Most of the life stories of famous and successful men fail to inspire because they lack the human element that makes the record real and brings the story within our grasp. (3) While we are searching far and near for some Aladdin's Lamp to answer the Sphinx’s riddle of fortune, there is ready at hand the interesting and vividly told story of one of the wisest and most useful lives in our own history, and perhaps in any history. (4) In Franklin's Autobiography is offered not so much a ready-made formula for success, as the companionship of a real flesh and blood man of extraordinary mind and quality, whose daily walk and conversation will help us to meet our own difficulties, much as does the example of a wise and strong friend. (5) While we are fascinated by the story, we absorb the human experience through which a strong and helpful character is building. (6) The thing that makes Franklin's Autobiography different from every other life story of a great and successful person is just this human aspect of the account. (7) Franklin told the story of his life, as he himself says, for the benefit of his posterity. (8) He wanted to help them by the relation of his own rise from obscurity and poverty to eminence and wealth. (9) He is not unmindful of the importance of his public services and their recognition, yet his accounts of these achievements are given only as a part of the story, and the vanity displayed is incidental and in keeping with the honesty of the recital. (10) There is nothing of the impossible in the method and practice of Franklin as he sets them forth. (11) The youth who reads the fascinating story may be astonished to find that Franklin in his early years struggled with the same everyday passions and difficulties that the reader experiences. Read in context, which revision to sentence 2 (shown below) makes the sentence gender neutral in the most economical way? Most of the life stories of famous and successful men fail to inspire because they lack the human element that makes the record real and brings the story within our grasp. a. "Most of the life stories of famous and successful men and women..."
b. "Most life stories of famous and successful people...."
c. "Most of the life stories of the famous and successful..."
d. "Most life stories of the famous and successful..."
34. Read in context, what is problematic about sentence 3 (shown below)? While we are searching far and near for some Aladdin's Lamp to answer the Sphinx’s riddle of fortune, there is ready at hand the interesting and vividly told story of one of the wisest and most useful lives in our own history, and perhaps in any history. 35. Read in context, which of the following is the best version of the underlined portion of sentence 9 (shown below)? The PRAXIS exam is required in 40 different states for teachers to become licensed to work in the classroom. Two PRAXIS exams are given; the PRAXIS Core Academic Skills for Educators exam or the PRAXIS I is taken by education majors either before college or in the freshman or sophomore year, while the Praxis II is taken by college seniors. Learn more about the PRAXIS Series with our PRAXIS Test Guide.